As far as the “Green” part is concerned, it’s urgently necessary to decarbonize the economy, shifting to a fully renewable electricity system and electrifying the transport system. The time when this could be achieved by a price-based policy (carbon tax or emissions permits alone) has passed. A carbon price is needed, but so is systematic regulatory intervention. Compared to politics as usual, this is a big deal, involving trillions of dollars in investment a complete restructuring of the energy sector, and radical changes to transport systems. It also has the potential for substantial net gains in employment – solar energy already employs three times as many US workers as coal. But relative to the US or world economy as a whole, a transformation of the energy and transport sectors is not a big enough deal to form the basis of a New Deal. Energy and transport together account for around 10 per cent of the economy, and replacing fossil fuels with renewable energy in this 10 per cent is not going to make a fundamental difference to the operation of capitalism. Quite a few ideas involving more radical economic changes have been proposed, including a Job Guarantee and Universal Basic Income. I’ve argued for a combination of these. In the specific context of a Green New Deal, the most important demand should be a reduction in working hours, with no offsetting change in wages. That amounts to taking the benefits of increased productivity, and progressive redistribution, in the form of increased leisure rather than increased consumption. It goes along with research findings suggesting that experiences, rather than material goods, are a better source of lasting happiness. To make the argument work completely, we need the further proviso that experiences arising from participation in family and community activities are more genuine than those offered by commercial providers such as tourism operators. I’d be interested to know if there is evidence on this point. I’m at an early stage on this, so I’ll stop here and leave it open for discussion. We can’t rely on markets. True, but still not enough. We are going to need more statist intervention in the economy. We need to make a fundamental difference to the operation of capitalism. This should mean up to and including the point where it ceases to be capitalism and becomes socialist, democratic and sustainable. They key will be re-working the category of “ownership” in our political economy. The conclusion of my research project, after researching this issue and discussing with participants in my research, is that it is difficult to ‘prove’ that more egalitarian societies will be more sustainable, however there are logical and value- based reasons to think they will. If you think – as you JQ seem to do and as I do – that fundamental social change is needed, that technological change will not be enough, then it seems much easier to achieve this if there is a basic sense of fairness. For example, if we need to limit consumption, then it will be easier to achieve if it applies to all. Mobilisation for war is often mentioned as an example of ‘whole society’ responses. Another interesting example was the Victorian response to the long drought, in which major restrictions in water use were achieved with ‘light touch’ regulation, and a lot of political leadership, social marketing, community education and community and individual action. Of course that’s a restriction in just one area of consumption, so much easier, but it provides a useful model. Ideally I suggest we need to get the idea of genuine egalitarianism out there – the old communist ideal of ‘to each according to their needs’. Of course this will require discussion and analysis of what went wrong with communism (I’d be interested in recommendations for good books on this). So those are certainly useful bits of evidence. Decarbonising the world economy is obviously a particularly important policy objective but hardly sufficient for achieving “an environmentally sustainable economy”. More generally we should seek to uncouple the economy from destruction of the planet’s natural resource base – that includes climate and the atmosphere – but also the oceans, soils, water resources and the planet’s forests and biodiversity resources. It also means being honest about the limits to growth imposed by unsustainable human population growth. Maybe, pursuing a broad agenda takes the focus off the particularly important climate task but it is very important to keep the broader agenda in mind. Broader sustainability objectives are fostered, as you mention, by encouraging more resource-neutral leisure activity, education and cultural pursuits. Fostering greater equality internationally (not just nationally) and empowering women to make fertility choices that suit them will also partly address the population issue. A key aspect of the world population problem is what will happen in Africa over the next generation or so – its implications will interact with but rival the impacts of climate. Africa is a world development priority. UBI more properly means the crazy idea of giving everyone unconditionally enough money to live on. It has never and will never work because it cannot work. If you look at the link, UBI here means GMI guaranteed minimum income- also called a BIG (basic income guarantee) or NIT (negative income tax) – which in turn is little more than “welfare” – and usually not a very good welfare program at that. But from the link – ” As a medium term policy, the best form of GMI would, I think, be the participation income advocated by the late Tony Atkinson.” “Participation income” is just another word for “job”. So what is being advocated as a JG + UBI is just a job guarantee, which is the only important (enormously important!) and beneficial idea in the mix. Good; this is a novel confusion, but do we really need more terminological confusion, even if it can catch some unwitting Basic Income fans? Neither AOC and friends nor JQ connect their GND to the looming need for massive net car on sequestration. Unlike most of the transition to net zero (as JQ says, the keys here are electricity and transport), there seems no prospect that this can be achieved by capitalist market forces, nudged along with limited public policy sypport. Carbon burial could be madd profitable, but only by public funding, as in a war economy. I’ll join Iko on the socialist trenches when we get to this point, if by any chance I’m still alive. One niggle I have about the AOC version is the coupling if the job guarantee to clean energy infrastructure. These are better separate than artificially linked. Much of the infrastructure that can be fixed with low-skill job creation is nothing to do eith energy: roads, bridges, trenches for burying cables. Wind in particular calls for high skills and unusual aptitudes. One job on offshore wind farms is applying special tape to the worn leading edges of trurbine blades. You start from the nacelle, 100m above the waves, then rappel down the blade another say 40m. That’s your workplace. It looks as if AOC is trying to recapture the innovation and can-do populist spirit of the initial New Deal of the early 1930s. The other available model is the war economy of 1941-45. This was run by the capitalists and managers in place at GM, Boeing, Grumman, Kaiser and so on, carrying out Washington’s strategy. Given the high technological content of the transition, I suspect it’s much closer to a feasible plan. Equity seems to be a key to getting wide support. The yellow vest issue of fuel taxes that hit the working class is a touchstone example. These are people who are half unemployed, don’t have the skills required by the modern economy, don’t have prospects for stable employment and have been ejected from cities by the cost of living so are reliant on cars for mobility. Their lives are more or less culturally invalidated. Greens tend to live in the happy productive professional city bubble. There is a divide to be crossed to form a coalition. It has been said that ‘Global warming is the biggest failure of capitalism’. If that is so, then we need to look at capitalism in a very different way. We need to look at a system that reduces inequality, rather than increase it. Inclusive Growth, strongly promoted by Joseph Stiglitz, and clearly a success in the Scandinavian countries, is a clear alternative. There is already a very notable shift from manufacturing and consuming goods, to providing services, in health, education, tourism, hospitality and human services. This creates a shift in employment to sectors of low CO2 emissions. As Peter Lewis observed this morning (The Guardian) the days of small government are over. Hans Rosling has much t say about population growth (https://vimeo.com/79878808) and makes it a manageable factor in the scheme of things. To me, the greatest factor preventing catastrophic climate change, is political inertia. As Stiglitz observed: “If economic forces are the same all over the world, why are outcomes markedly different? It clearly shows that differences in outcome are greatly affected by policy and politics”. taking the benefits of increased productivity, and progressive redistribution, in the form of increased leisure rather than increased consumption. But it’s not just not true that increased productivity is synonymous with increased consumption, impliedly frivolous consumption. One thing increased productivity buys is better health care. You know that MRI machine that detected your aneurysm and without which you have died? It was paid for by increased productivity. It’s the main reason rich countries have them and poor countries don’t. Then there’s the not small matter of essentially decreeing to people that the rewards from their labour must be (officially approved) experiences rather than more stuff. This is just the kind of thing that sets off populist revolts. As you note JQ research on community vs commercial experience difficult to find it seems. “Rather than gifting $150K in ratepayers’ funds to the commercial benefit of a private golf club, with no additional benefit accruing to the community, the association believes it would be much smarter for Council to apply the $150K toward the extension of the effluent reuse scheme to the Pambula Sporting Complex, creating multiple benefits to the entire community, including reducing the volume of effluent being reused on our beaches to 60%-65% of the annual volume: a proposal that surely satisfies the “public interest test”. I agree, it is probably difficult to prove that more egalitarian societies will be more sustainable. However, on the balance of probability it seems likely. In a more egalitarian society there will be a greater feeling of solidarity and common interest; that it is in everyone’s interest to seek sustainability. In an unequal society, a rich minority can make business decisions to shovel many negative externalities away from themselves and in the direction of the poor. The rich can also use their wealth to avoid impacts from generalised negative externalities and direct dwindling resources to themselves. An egalitarian society has better incentives to seek sustainability. East Germany was (supposed to be) an egalitarian society, and in a way it was, yet by the time the Sozialistische Einheitspartei Deutschlands handed back the keys of the car to the west Germans, as it were, the whole of East Germany was one big toxic waste dump. Environmental concerns were not exactly front of mind for the comrades. We all have some understanding of the implications that runaway climate change will have. We all understand, as well, that something must be done to try an avert it, to the extent that averting it is feasible. So far, so good. The question, however, is what to do (we can leave a related question, who will carry the burden of doing it, for another opportunity). Roughly speaking, there are two options: Green New Deal and Degrowth. What makes you pick GND? Why not Degrowth? Its a pity all this has to be done not just without the help of the 1% but with them working vigorously against it. History shows how rapid and successful social engineering can be when that kind of power is mobilised, at the moment most of most peoples publicly stated general beliefs are contrary to their own human nature. Polled on specific issues the masses are demonstrably Socialist ,but they dont vote that way and will even fight against such sentiment. Those calling themselves Conservative have proven to be the masters of social engineering- but of course it helps to have the vast bulk of wealth and power behind you. I have done some research in the area of social engineering and have read the fine work done by Thomas Piketty. But reality tends to make nonsense of economic research. The situation in both France and the USA seems to bear this out in an alarming fashion. Both countries are run by politicians who support the top income earners but ignore the lower income earners. Yet as Piketty rightly points out it is not all about income. Wealth distribution is also been politically facilitated towards the wealthier groups. Short of some major war bringing together these income/wealth groups there seems to be no way forward. My only suggestion is that death duties need to be returned to the tax mix, As Piketty rightly pointed out, inheritance is the major cause of wealth distribution in many countries. Inherited wealth also seems to come with higher income streams. Exactly how an inheritance tax is implemented will depend on the political realities of separate countries. It is by no means a cure all but it may just be a good start towards a successful social engineering of today’s economies. Economists need to keep this in mind during any public debate on this topic. Yes apart from the failure of the egalitarian ideal, communist societies have tended to be environmentally destructive, as much, sometimes more, than capitalist societies. (If we look at contemporary China the situation seems a bit different – they have been, but seems they are now in some ways more able to make a shift to renewables, as a more central command economy). Seems the communist societies shared same values as capitalist societies in terms of industrial goals Marx didn’t critique industrial production of goods as such, including the environmental impacts, as far as I’m aware. Communist societies also got caught up in the technological-military race with capitalism. Long story, but again I’d welcome recommendations for good sources analysing the failures of communism. JQ, I guess you are aware of the psychological happiness/wellbeing research? Seems established that good relationships, volunteering, and ‘experiences’ vs material goods (for those who are not poor) contribute to happiness, but I don’t know of any specific research about the nature of the experiences. Another question I would like to raise is about ‘productivity’. Seems to be taken as an unexamined good in dominant economistic discourse, but it’s quite hard to work out what people mean by it. I did some searching around fir my thesis and at basis it usually seems to mean something like ‘the production of more goods and services for less HUMAN energy expenditure’ (I emphasise human because that seems to be the defining feature). We need a critique of productivity. Obviously, the reduction in human energy is often because of the substitution of fossil fuels, so that’s one big problem. However even more fundamentally from a public health point of view, reduction of energy isn’t necessarily a good thing – many of our current health problems are related to inactivity. Maria Mies is one of the few economists I’m aware of who talks seriously about these issues – she grew up in a peasant household in Germany and talks seriously about why the labour intensive traditional way of doing things may be better in many ways. Of course such people are often dismissed as Luddites etc, but I think ‘productivity’ and the underlying assumption that anything that reduces human energy expenditure is a ‘Good Thing’ needs to be seriously thought through and critiqued. It continues to astound me just how committed many people are, but especially the 1%. My boss is currently having a new office/warehouse constructed to his design. It’s in western Sydney but has lots of north-facing glass, uninsulated tilt-slab walls and no solar despite a large roof area. I’ve asked about that and he claims it would be inconvenient. By design, and for the 30+ year life of that building, on a 40 degree day that building is designed to become uninhabitable within half an hour of the power going off. Which is increasingly likely to happen as temperatures rise. With power it’s “just” going to take 10kW or so of air conditioning (or the output of maybe a quarter of the roof covered in solar panels). I can’t discuss this with him without putting my job at risk (partly because of my own exasperation). A green new deal is going to involve a great deal of saying to people like my boss “nice building you just paid for, now knock it down and try again”. And “nice luxury car you just bought, hand it over and buy an electric one”. Use of additional Aussie vernacular not required but not inappropriate. We’re going to get degrowth whether we want it or not. We’re trashing the ecosystems we depend on, and that’s not going to end well. The Green New Deal is an attempt to limit and control the degrowth, or at the very least sensibly prioritise our response to it. A lot of it should be pouring silly money into research and science, both to find ways out of the hole we’re in and to document what we’re destroying in the hope that that information will be useful later. A bunker full of stone tablets is likely to be more useful than one full of billionaires… if you must build a bunker. I have not read these titles myself but I have read a number of Foster’s in-depth articles on this topic on the Monthly Review site. It is clear from Foster’s quotes of Marx and Engels that M&E did grapple with this issue and wrote quite extensively about it. There is no case at all, in my view, that Foster is making a revisionist reading and imputing insights to M&E which they did not have. This is not to say that M&E had as clear a view of ecology and ecological as scientists do today. Clearly, they did not. Marx investigated the issue of soil exhaustion through large-scale agriculture and its replenishment with fertilizers (bones, guano). Marx was a voracious reader of the scientific literature of his day and paid particular attention to the works of Justus Freiherr von Liebig (12 May 1803 – 18 April 1873), the “German chemist who made major contributions to agricultural and biological chemistry, and was considered the founder of organic chemistry.” Marx and Engels also paid attention to deforestation and its effects on soil, rain, run-off and local climate. There were already historical examples to examine in their time. Marx’s terminology is old-fashioned by our standards. He referred to the “metabolic rift” between town and country, his meaning being that the town was taking nutrients and resources from the country and not returning them except by newer and more artificial processes like bone fertilizers (quite often human bones from old battlefields on the Continent) and guano from the southern hemisphere. Bellamy has updated the terminology of “metabolic rift” to “ecological rift”. In addition, the term “dialectical materialism” (not coined as such by M&E ) really means material feed-backs in a complex material system. Marx and Engels were aware that what humankind did on a large scale industrially did affect nature and that nature would react back (feed-back). It can be argued that the later Marx and Engels did become aware that there would be material limits to capitalism, meaning limits to the accumulation of fixed capital as infrastructure, machines etc. because of natural limits and the fact that nature is not passive but reacts to our actions. This is certainly true. It’s a particular tub that I thump quite often. I have pointed out on J.Q.’s site a number of times that geostrategy affects political economy affects economics. Thus, to take things in reverse, people who want to talk solely about economics (a favorite gambit of the market fundamentalists) are either dishonest or ignorant as they are ignoring the full system of complex interactions. Certainly, it is true that interactions go both ways: thus geostrategy affects political economy affects economics and economics affects political economy affects geostrategy. The thing is, we cannot pretend geostrategy is not a factor. Empires often tend to “fight to the death” with both other empires and with rebellious vassal territories. Compliant or subdued vassal territories are “merely” pillaged. Of course, the tendency to fight to the death has countervailing tendencies. Exhaustion, war-weariness and internal dissent play a role along with genuine wishes to co-exist peacefully and benefit from trade and interchange. The victorious capitalist states from WW2 (and even the defeated capitalist states after their re-construction) combined, or rather were combined under the leadership and pressure of the United States, to defeat communism long-term. Immediate military defeat was no longer an option due to the Soviet Union rapidly developing nuclear weapons so that a state of MAD (mutually assured destruction) existed. The alternative was a technological and arms race where the resources of the whole world (sans Russia of course and perhaps China) were combined into one inter-related system to defeat Soviet Communism. It was the Soviet Union versus the whole world with China at first on the sidelines. This imbalance really reflected the WW2 imbalance all over again. Recall that WW2 consisted of the Axis Powers versus the rest of the world. The Axis Powers were essentially Germany and Japan (only) as their other allies were insignificant productively and strategically speaking. It was the human-power and productive power of Germany and Japan versus the rest of the world. No contest. The rest of the world was always going to win a long war of attrition due to its much greater productive power. Large conventional wars prosecuted to unconditional surrender are always wars of attrition. The “rest of the world” included the USA with 45% of the world’s productive power at the time plus Russia, Great Britain and the Commonwealth and China (fighting on its own soil against the Japanese from 1937). Similarly, when the Soviet Union faced a new “rest of the world” (with China out of the game due to being internally convulsed and in a tense relationship with the Soviets anyway), it was again the case that the massively more productive alliance bloc was going to win in one way or another. The rest of the world broke the Soviet system by pushing the enormously expensive arms race on the Soviets (who fell for the bait and over-invested in arms). Soviet communism was never true communism nor true socialism. It is more correctly delineated as being a state capitalist system. But that is a debate for another thread. Essentially, the situation is that the Chinese leadership and/or people are being a whole lot smarter than the Soviets were. First, China realized that way to beat capitalism was to join it (for a time). This strategy is actually an application of Marxist insights though not classical Marxism as such. With its low labor costs, China realized it could attract world industry to China. Greedy capitalists from all over the world would fall for the bait and move manufacturing to China. China could de-industrialize the West over time and concentrate world manufacturing in China. My presumption is that the end-game is to switch from exporting to the world to exporting to China’s interior (still at least 600 to 800 million people to be brought into their capitalist consumption system). The rest of the world (now substantially de-industrialized will be left to decay but to still provide raw materials to China). In addition, China has formed up and is progressing the Shanghai Cooperation Organisation (SCO). Have a look at the current membership of China, Kazakhstan, Kyrgyzstan, Russia, Tajikistan, Uzbekistan, India and Pakistan. China understands the importance of forming large-scale, long term bloc alliances with more humanpower and productive power than competitors. It will not be long before this alliance outranks the “triad alliance” of USA, EU and Japan (all of whom are decaying compared to the current development of China). The USA on the other hand is ditching alliances and becoming isolationist to make itself “great” again. The Chinese are in no hurry. “Never interrupt your enemy when he is making a mistake”. – Napoleon. “The supreme art of war is to subdue the enemy without fighting.” – Sun Tzu. I do wonder though if the Chinese realize that the limits to growth and climate change are going to hit them as hard or harder than anyone else. When everyone fights, even in economic war, everyone loses. This is the final, hard lesson we are all going to learn. 2. The closest M&E got to coining the precise term “dialectical materialism” was the “materialist conception of history” (Marx) and “historical materialism” by Engels. But the inherent meanings are substantially the same and clearly M&E followed a method transforming Hegelian (idealist) dialectics into material dialectics (feed-backs in complex systems and the idea of new, emergent phenomena from the interactions of simpler elements). Pursuing degrowth as a sustainability objective is different from facing a crisis that threaten all life on the planet. You mention insect populations but there is a more general biodiversity contraction and extinction process going on that is global in character – China as well as developed countries are destroying the biodiverse environments of Africa and South America. They are destroying water resources in Australia through trade in water-intensive products and through purchases of property here. Most of the world’s fisheries are faced with the prospect of catastrophic collapse – of depensatory growth that means positive stocks shift rapidly and unexpectedly to zero. And of course the major global issue of destroying the earh’s climatic resources as the atmospheric environment via continuing major air pollution problems. Finally, there are global problems of soil and water resource overuse and destruction. Its a crisis and the old “leftie” obsessions with “fair” wages and worker’s rights are almost irrelevant in the face of this crisis. We want redistributions but the main redistributions required are away from resource-using activities – more non-destructive leisure, cultural and educational activities, more appreciation of nature. We also want global social and income redistributions that give women, particularly in Africa, the chance to make more sensible fertility choices. Finally, instead of seeing depopulation via falling fertility or less immigration as a short-term threat that will damage next year’s budget or the housing development industry – we should see it as a bonus that should be encouraged. Our time horizons should be at least 10,000 years not June 2020. A brief read, I like this also. the Greens seem to have gotten away from their original rationale and bullied by Murdoch and the major parties, surrendered to tabloid and emotive politics shopfront devoid of an underlying critique required to understand the REAL problems involved with environment, defined in the denial of the relationship between enviro and economics and how it, in turn, relates to neo liberalism, use versus exchange value and the rationalise od economics and resources to deal with human need rather than something maintains the insane reified cultural mechanisms that keep obsessive, commodifying greed, fear denialism, magic thinking and lack of temperance dominant. Must read comment section before proceeding further, may comment a bit later but must rush for now. Our time horizons should be at least 10,000 years not June 2020. Yes. 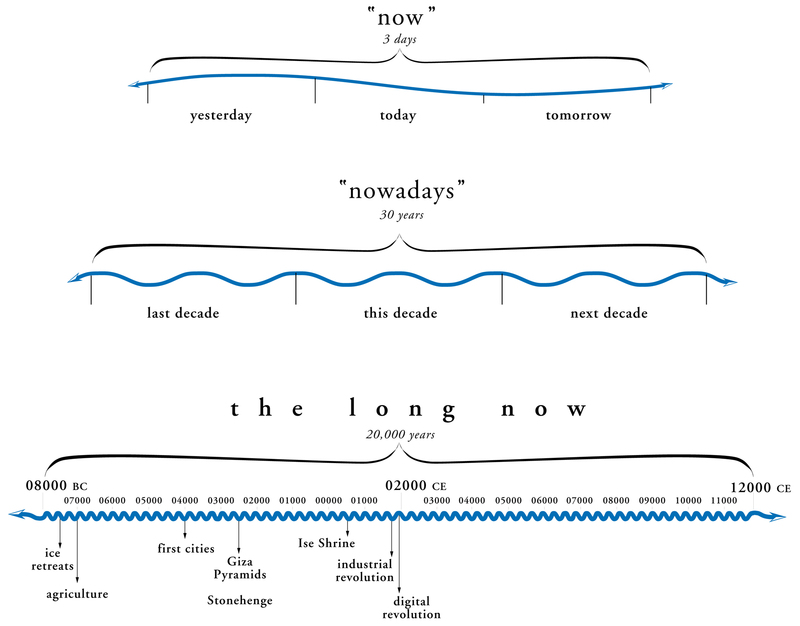 The concept of “the long now” is a good one. I would hope that as a part of a Green New Deal we could smash the paradigm that job creation is inherently good. When you think about it, the paradigm is irrational unless you have the lugubrious view that most people will not be able to shape meaningful lives for themselves with their new found freedom. I still see a massive disconnect between scientists and citizens who know what is happening and the great majority who have only the vaguest idea or none at all. The core of scientists who know what is happening are those who write IPCC reports and sign warnings like “World Scientists’ Warning to Humanity: A Second Notice.” Citizens who know what is happening are those science-literate citizens who read such reports, apply themselves to understanding them at intelligent layperson level and are not too invested in believing in false ideologies from religion to market capitalism. Outside this group, in the developed world, are the average, mostly science-illiterate citizens who care about jobs and consuming and little else. Then there are the great masses of people (still several billions), beyond the developed world, who have no schooling at all in these matters and no time to think about them as they hard-scrabble to survive month by month. When it comes to religions and ideologies, people can be induced to believe almost anything. When it comes to science and the physical world, they will believe only their personal sense data (eyes, ears, pain receptors etc.) after direct physical demonstrations from experiments or natural events. It’s interesting to ponder why this is so. Immediate adaptive responses to the natural world came first in evolutionary terms. That part of our nervous system is adapted to require direct sense data to be convinced of the reality of something. Social and language development came later and social-language concepts are much more loosely tethered to giving accurate representations of physical reality. To summarize very briefly, general language has become much more tied to the generation of social and fanciful concepts rather than to the description of the real, at least when compared to the operations of healthy and unimpeded senses which cannot, for example, prevaricate about terror and agony. Ipso facto, people won’t believe a real physical (and ecological) disaster is happening until it happens to them (or close kin) somatically, that is to say to their very bodies, including to their sense apparatuses which give direct warning of impending and imminent physical harm. This is why I say it will take direct, catastrophic demonstrations from nature to convince people this crisis is real. Fish-kills up river are clearly not enough. People watch that news item and then go back to watching the tennis. Only when people are dying in the streets will the general populace believe this is real. Incremental change from one generation to the next doesnt bother people too much . As long as their lifestyle is not radically different from their parents or grandparents .Over the generations the process can quietly get to the point of system failure . Its happened to civilisations fairly frequently across the span of human history. Pacific island cultures make interesting subjects in this way, being so isolated, some just slowly used everything up, even cutting down the last tree or killing the last pig. Soil health was a common problem. Science seems to be giving us advance warning this time, but that may not help because coordinated global action is required rather than just the word of the local chief or tribal council. They say it happens to blokes as they get older but I have lost alot of hope for the world over the last 3 or 4 years. As one ages beyond middle age, one loses illusions about oneself and about humanity in general. The challenge is to find a way to live without hopes and illusions. Best to keep tinkering with personal projects that keep one going, I find.